Aurora Rex Rabbit Ranch uses large rabbit hutch frames constructed of Schedule 40 PVC, on which we hang 4 all-wire rabbit cages. The hutch frame is almost indestructible, and cleaning is a breeze. Just cover and use. We set them up in our rabbit barn years ago. While the grey Sch. 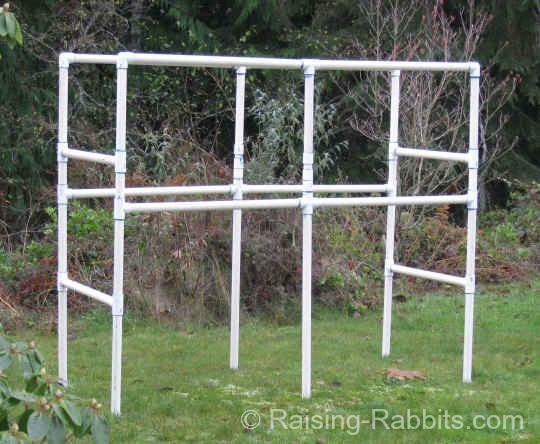 80 PVC is reported to be much stronger, our PVC hutch frames have as yet had absolutely no issues with breaking, despite heavy use and lots of daily movement by the rabbits. 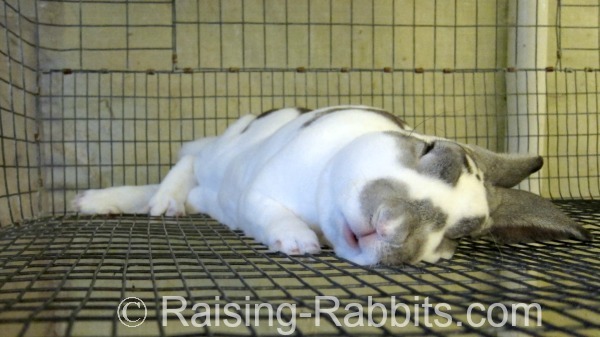 Otherwise, read on; perhaps you'll appreciate a new perspective on rabbit hutches. This PVC hutch frame has finished dimensions of over 7 feet wide and 6 feet high. It handles two tiers of cages, and there’s room to put a slanted drop pan underneath the top tier for ease of cleaning. See how to set it all up with cages, water and feeder. We show you how to hang the cages on the PVC hutch frame, how to install the drop pans, and set up a gravity-fed automatic water system by Edstrom. 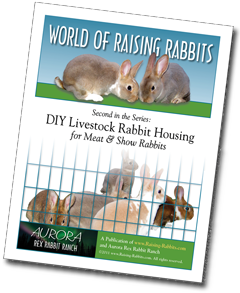 Or: Visit World of Raising Rabbits for more information and to check out all of our rabbit husbandry e-books. What's so Great About our Hutch Frames with Hanging Wire Cages? Why not just give a rabbit a wooden rabbit hutch? Well, you certainly CAN give wooden hutches to your rabbits, if you like. I don’t think wooden hutches are necessarily ideal – you’ll find this opinion in more detail and the reasons for it at Wooden Rabbit Cage. Rabbit owners in Europe use wooden hutches almost exclusively. In fact, some countries now have laws outlawing wire flooring for rabbits. 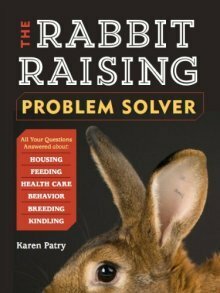 Unfortunately as is frequently the case, those (activists) arguing for hard floors did not understand the complete picture and were not familiar with rabbit husbandry. Except for the danger of sore hocks in some breeds, wire floors are very healthy for rabbits. The floors stay clean as the urine and feces drop through the wire. As a result, the rabbit does not re-infect itself with parasite eggs, and this breaks the lifecycle of parasites such as coccidiosis, keeping the rabbit much more healthy. Additionally, all-wire cages are typically much stronger than a wooden hutch to which some cheap wire mesh has been stapled. All-wire cages protect the rabbit from predators. The wire sides provide ample air circulation so that ammonia can dissipate keeping the rabbit’s lungs healthy. The benefits of all-wire housing far outweigh the drawbacks in my opinion, especially when the rabbit owner also pays attention to and cares for the health of the rabbit’s feet. There IS a drawback for wire floors for some breeds of rabbits which you should know about, especially when low quality wire mesh is used. Rabbits with rex fur tend to have shorter fur on their foot pads. Cage wire, especially thin, rough or rusty cage wire, can wear the fur off the bottom surface of the rabbit’s foot. This usually occurs first on the hind feet, but can also affect the front paws as well. Rabbits on many other surfaces, including carpet, can also experience a thinning of the fur and the development of heavy calluses on the hocks of the hind feet. If the calluses then break down, open sores can develop on the hocks. This can happen to any rabbit of any breed, and is not necessarily related to wire cages. See Rabbit Feet. Giant rabbits apply more weight per square inch on their hind feet. Even though they have normal fur, the exaggerated pressure can result in worn fur and then callus formation. Provide a resting board of some sort inside the cage which will provide relief from the wire. For the very largest of rabbits, unless you have used very heavy, non-sagging, 12 ga floor wire, using a hard floor with deep litter is the best choice. Or, provide a very large cage with half-wire and half-hard flooring. Are Wire Rabbit Hutches Comfortable? What about comfort? Isn’t sleeping on wire very cold and uncomfortable? Not by the looks of this snoring rabbit...! The combination of all-wire cages and PVC hutch frames has proven to be the best of all worlds. By suspending all-wire cages, there is nothing under the cage that can result in a pile-up of manure or urine. The wire provides many air exchanges, preventing the build up of ammonia. It is SO EASY to remove the cage from the hutch frame in order to give it a thorough cleaning or sanitizing. PVC is light, strong, and durable. It eliminates the problem wood introduces - soaking up urine and reeking of ammonia. PVC is also smooth, helping to eliminate access to the rabbits and nest boxes by rats. 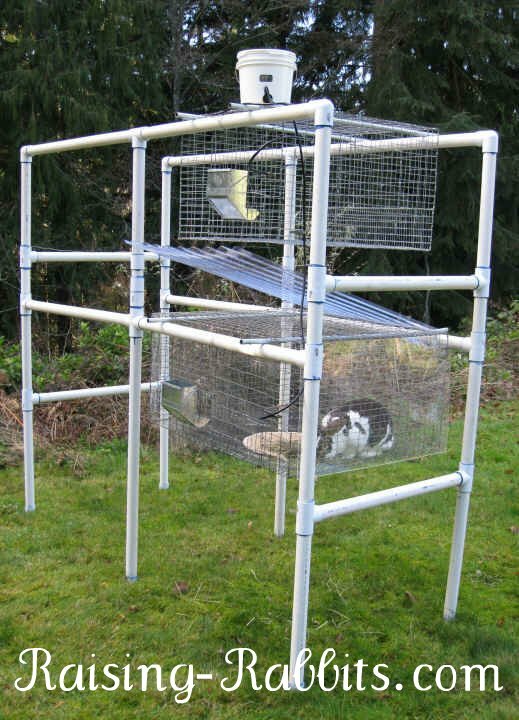 And by giving the PVC frame longer legs, other larger predators cannot reach the cage bottoms to scare and harass the rabbits. Using all-wire cages hung from our PVC hutch frames has been so successful that we collected our plans into several e-books in order to help you get the benefits of building them too. Serious rabbit breeders and rabbit owners of more than a few pet rabbits: See DIY Livestock Rabbit Housing for Meat and Show Rabbits for more information and to purchase this e-book. It contains the plans for the very large PVC hutch frame pictured above, many more plans, plus a BONUS: TIPS for getting the PVC angles right. Pet rabbit owners with just 1 or 2 pet rabbits, including indoor rabbits: See Pet Rabbit Living Spaces for more info and to purchase this pet-owner's e-book. It contains plans for a much smaller PVC frame that will hold our 36”x30” all-wire cage, and many more plans suitable for pets. It also includes many variations on the dimensions so you can find a size or sizes that are perfect for you and your rabbits. Want BOTH of the above e-books? We put them all together into ONE e-book titled Ideal DIY Rabbit Cages for All Rabbits. With this e-book, you don’t need any of the other cage e-books. Click on the link for more information and to purchase this e-book. All our World of Raising Rabbits E-Books can be found here, including the above hutch and cage e-books.